After the first sip you may wonder if your finest crystal snifter is good enough for Vigia Gran Reserva 18 YO Cuba Rum. TecnoAzucar produces a few premium Rums, Vodka, candies, and household items and yes, there is a picture of Fidel Castro on the office walls. Ron Vigia Gran Reserva 18 YO Cuba Rum is named after Finca Vigia—the famous “Lookout Farm” where Ernest Hemingway lived for a few years while writing “For Whom the Bell Tolls” and “The Old Man and the Sea.” During this time, it is no secret that the great writer drank more than his share of Rum and Rum-based adult beverages. And this one is a limited production Rum worthy of that reputation. Somewhere just off the Cuban coast, a cruise ship bar disgorges frozen, Rum-laced smoothies into plastic cups for intoxicated travelers seeking advanced levels of inebriation as they dance the Macarena on the Lido deck. This ain’t for them. Vigia Gran Reserva 18 YO is a premium Rum, no two ways about it. It is aged for a full 18 years in white oak, giving it a character more akin to a fine cognac than Rum. It would be a shame to blend this sipper up into a daiquiri de’ tourista. Better to pour it into a fine crystal snifter and sip it as it should be, with all of the care and attention this fine Cuban liquor deserves. 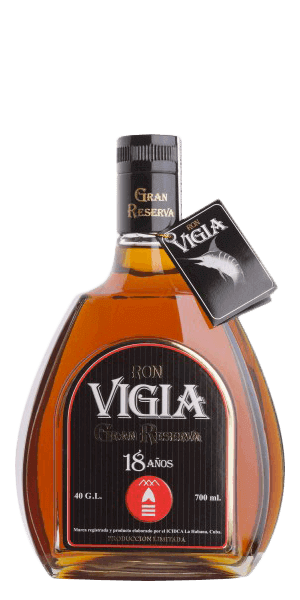 What does Ron Vigia Gran Reserva 18 YO taste like? The Flavor Spiral™ shows the most common flavors that you'll taste in Ron Vigia Gran Reserva 18 YO and gives you a chance to have a taste of it before actually tasting it.